Goodreads Summary: This thrilling sequel to the much-talked-about Nightshade begins just where it ended-Calla Tor wakes up in the lair of the Searchers, her sworn enemy, and she's certain her days are numbered. But then the Searchers make her an offer-one that gives her the chance to destroy her former masters and save the pack-and the man-she left behind. Is Ren worth the price of her freedom? And will Shay stand by her side no matter what? Now in control of her own destiny, Calla must decide which battles are worth fighting and how many trials true love can endure and still survive. If you haven't read Nightshade, go buy it and read it immediately. Do not pass go, do not collect $200. 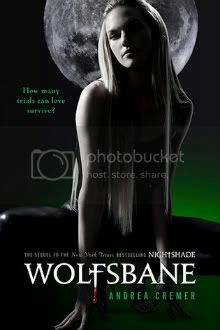 If you've read it, you know that Nightshade is amazing and that the wait for Wolfsbane was cruel and unusual punishment. Wolfsbane begins just after the end of Nightshade. Calla Tor wakes to find herself surrounded by Searchers, far removed from her pack, from everyone but Shay. She is desperate to find her way back to her home, but the Searchers have other plans for her. They need her and her pack as allies in their war against the Keepers. At first, Calla refuses - after all, she's fought the Searchers all her life - but the more she talks to them, the more she comes to realize that some of her long-held truths were actually lies. But no matter what has happened, she is the alpha, and she has to help her pack...and her mate. Yet will Calla be torn between love and duty? And can she find her pack - and protect them - before it's too late? I was thrilled to be back in the Nightshade world. Once again Andrea's writing drew me in and kept me turning page after page, needing to know what happened next. In addition to seeing more of Calla and Shay, there are a new cast of characters to meet, each with their own stories and quirks, and some (especially Connor and Adne) with very entertaining senses of humor. The details and descriptions are always so vivid, and the constant plot twists and romantic tension make for riveting reading. The stories and memories revealed in Wolfsbane are by turns alarming and poignant. Wolfsbane is just as intense as Nightshade, but in a different way - it has a darker tone and is driven more by events than by the romantic tension, but for this book that certainly works. My only complaint about Wolfsbane is that it ended when it did - I wanted more! Is it time for Bloodrose yet??? I've said this before, and I'll say it again - Andrea Cremer's writing style is brilliant. I absolutely cannot wait to read the third installment of this story! I might have to take you up on this. The author is a professor at a college local to me. I read about her in the paper yesterday. New follower. Love your blog. Great review! I can't wait to read this one! Preordered my copy with Borders awhile back but will have to find out if they'll send it to me because of they're going out of business (sob! )!